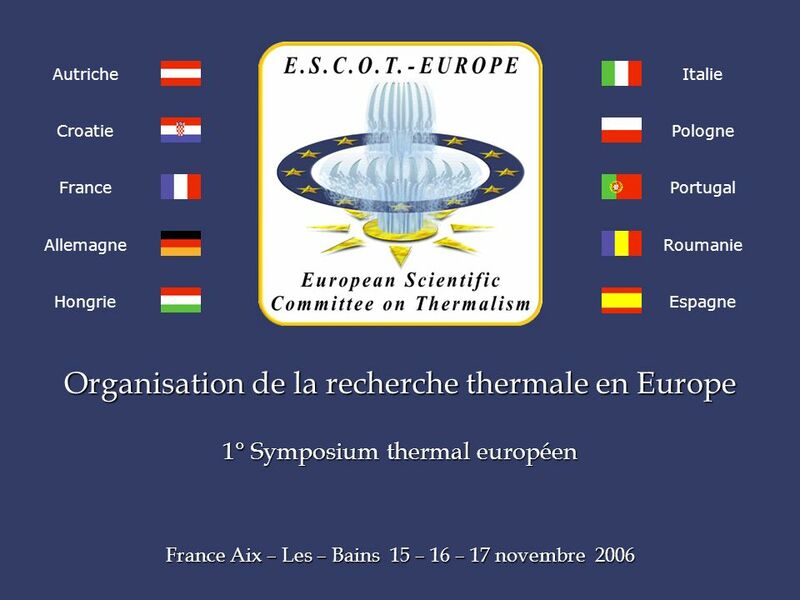 Organisation de la recherche thermale en Europe 1° Symposium thermal européen France Aix – Les – Bains 15 – 16 – 17 novembre 2006 Autriche Croatie France. 7 PURPOSES AND AIM OF THE COMMITTEE The Committee is non political and doesn't have a profit finality. 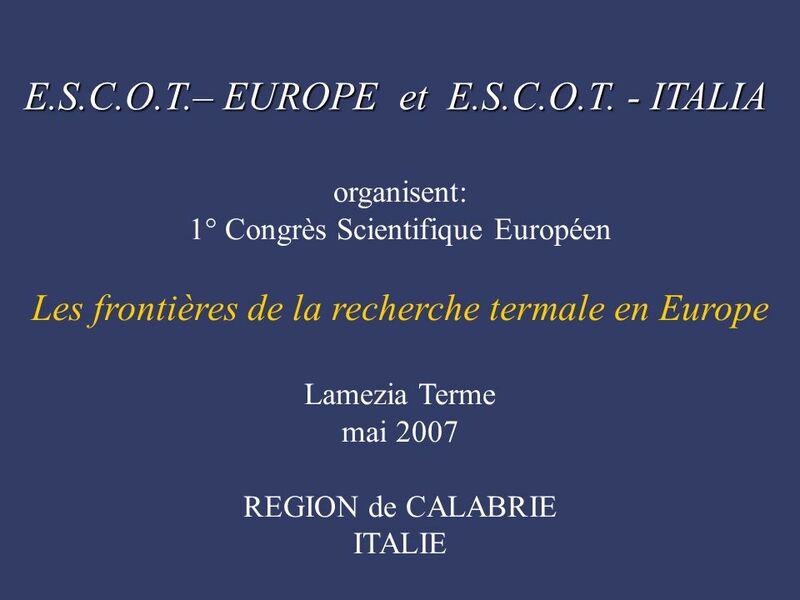 The main mission of E.S.C.O.T. 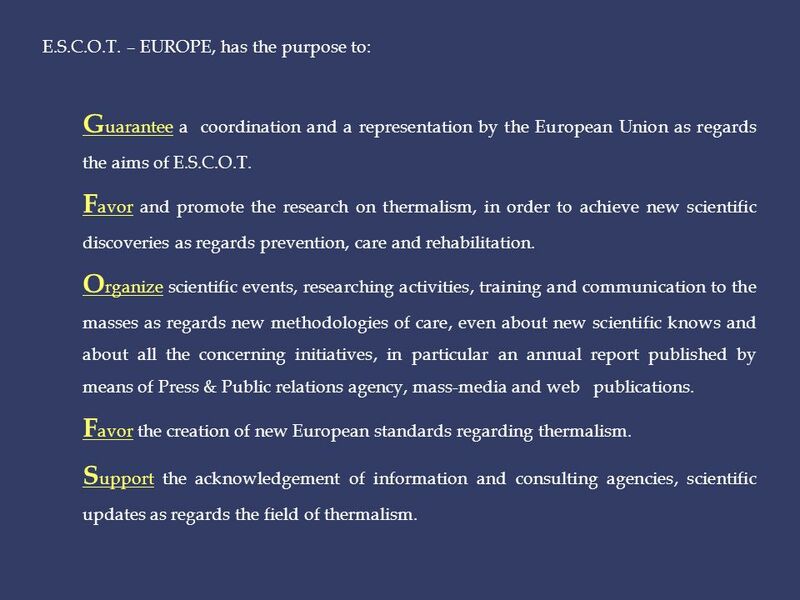 – EUROPE is to promote, coordinate and standardize the scientific research of the thermal cares regarding the three fundamental aspects of prevention, care and rehabilitation. 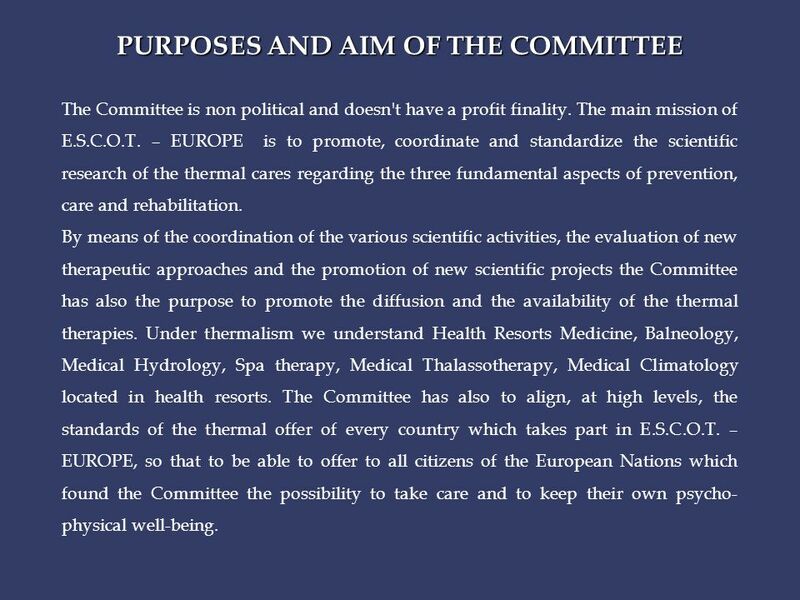 By means of the coordination of the various scientific activities, the evaluation of new therapeutic approaches and the promotion of new scientific projects the Committee has also the purpose to promote the diffusion and the availability of the thermal therapies. Under thermalism we understand Health Resorts Medicine, Balneology, Medical Hydrology, Spa therapy, Medical Thalassotherapy, Medical Climatology located in health resorts. 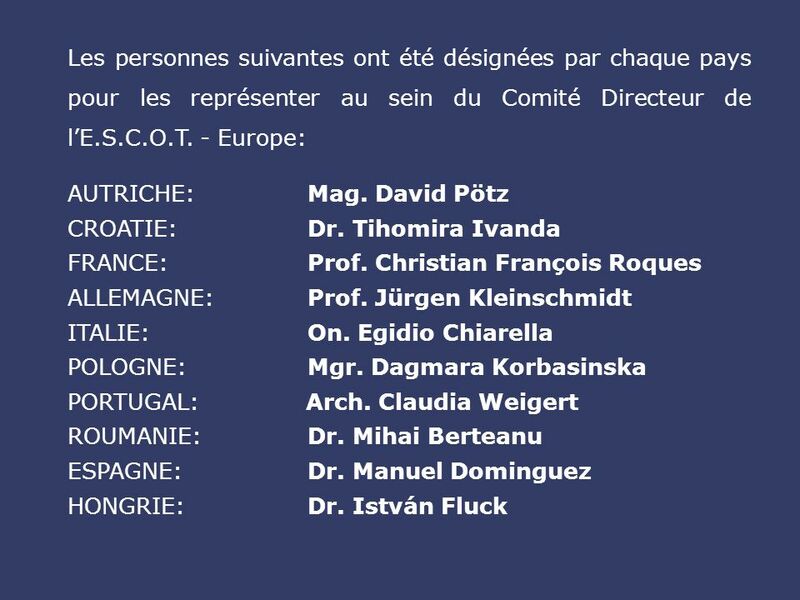 The Committee has also to align, at high levels, the standards of the thermal offer of every country which takes part in E.S.C.O.T. – EUROPE, so that to be able to offer to all citizens of the European Nations which found the Committee the possibility to take care and to keep their own psycho- physical well-being. 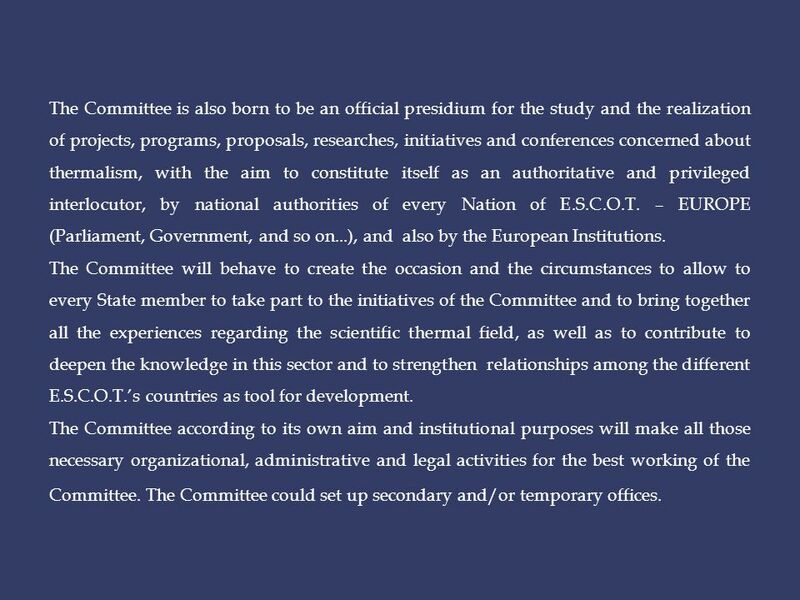 8 The Committee is also born to be an official presidium for the study and the realization of projects, programs, proposals, researches, initiatives and conferences concerned about thermalism, with the aim to constitute itself as an authoritative and privileged interlocutor, by national authorities of every Nation of E.S.C.O.T. – EUROPE (Parliament, Government, and so on...), and also by the European Institutions. The Committee will behave to create the occasion and the circumstances to allow to every State member to take part to the initiatives of the Committee and to bring together all the experiences regarding the scientific thermal field, as well as to contribute to deepen the knowledge in this sector and to strengthen relationships among the different E.S.C.O.T.s countries as tool for development. The Committee according to its own aim and institutional purposes will make all those necessary organizational, administrative and legal activities for the best working of the Committee. The Committee could set up secondary and/or temporary offices. 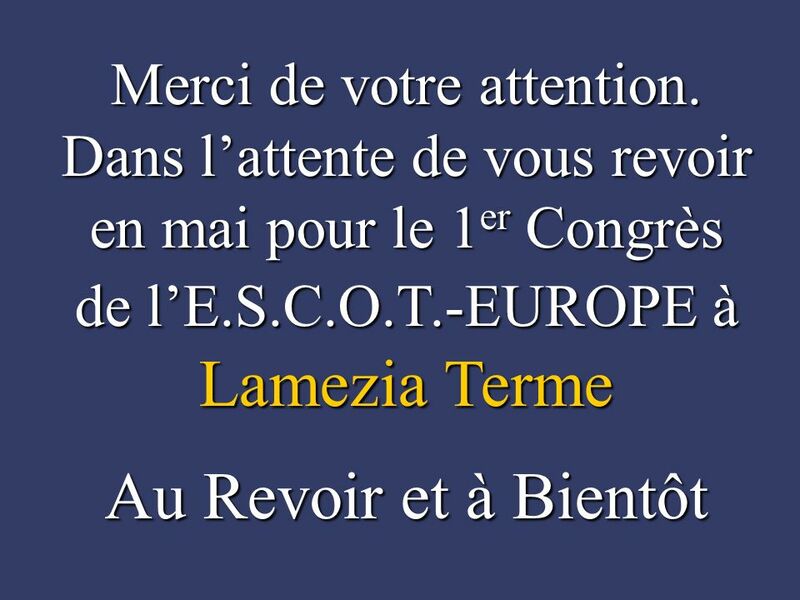 9 E.S.C.O.T. 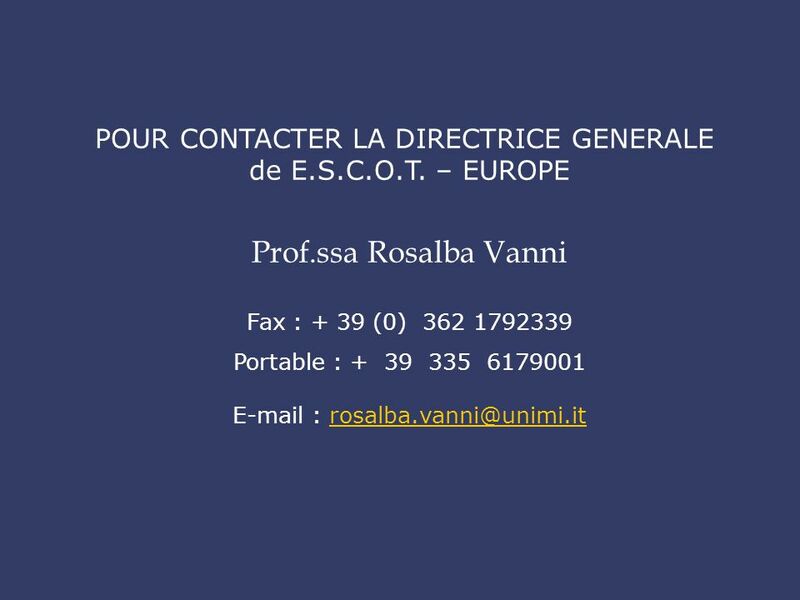 – EUROPE, has the purpose to: G uarantee a coordination and a representation by the European Union as regards the aims of E.S.C.O.T. F avor and promote the research on thermalism, in order to achieve new scientific discoveries as regards prevention, care and rehabilitation. O rganize scientific events, researching activities, training and communication to the masses as regards new methodologies of care, even about new scientific knows and about all the concerning initiatives, in particular an annual report published by means of Press & Public relations agency, mass-media and web publications. 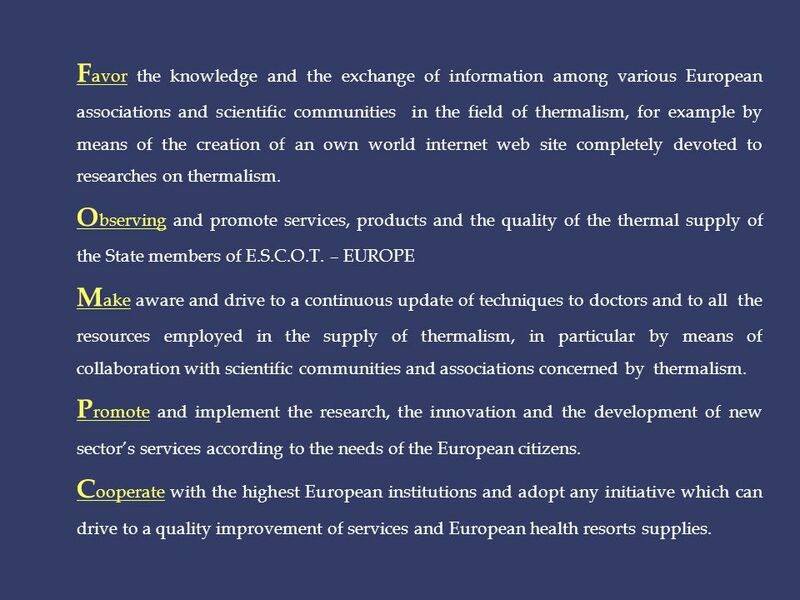 F avor the creation of new European standards regarding thermalism. 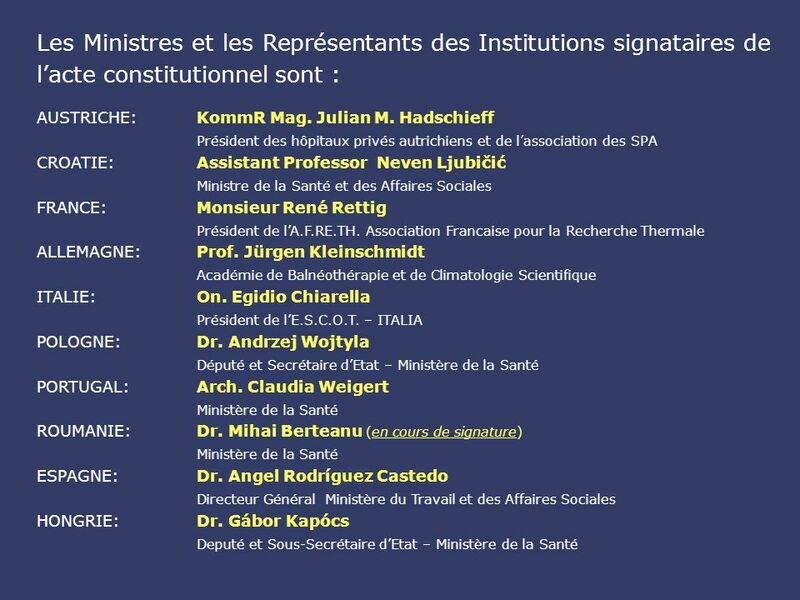 S upport the acknowledgement of information and consulting agencies, scientific updates as regards the field of thermalism. 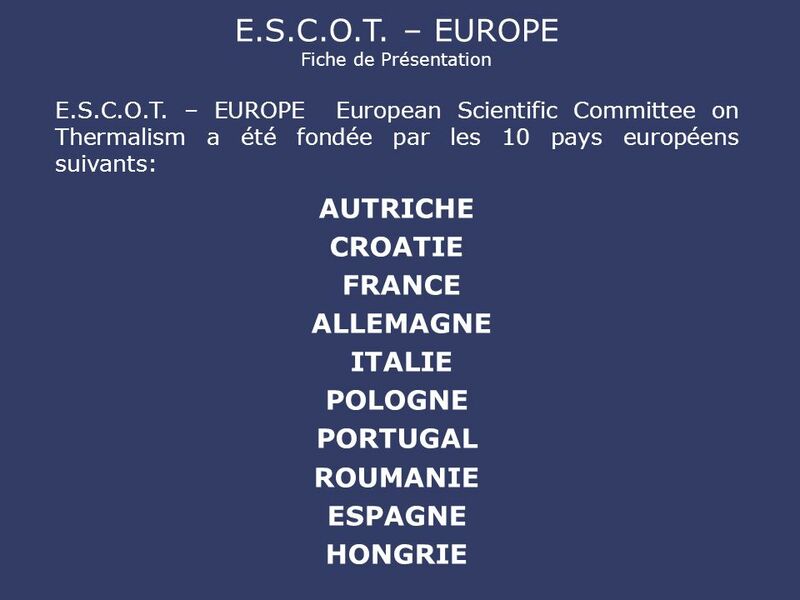 10 F avor the knowledge and the exchange of information among various European associations and scientific communities in the field of thermalism, for example by means of the creation of an own world internet web site completely devoted to researches on thermalism. 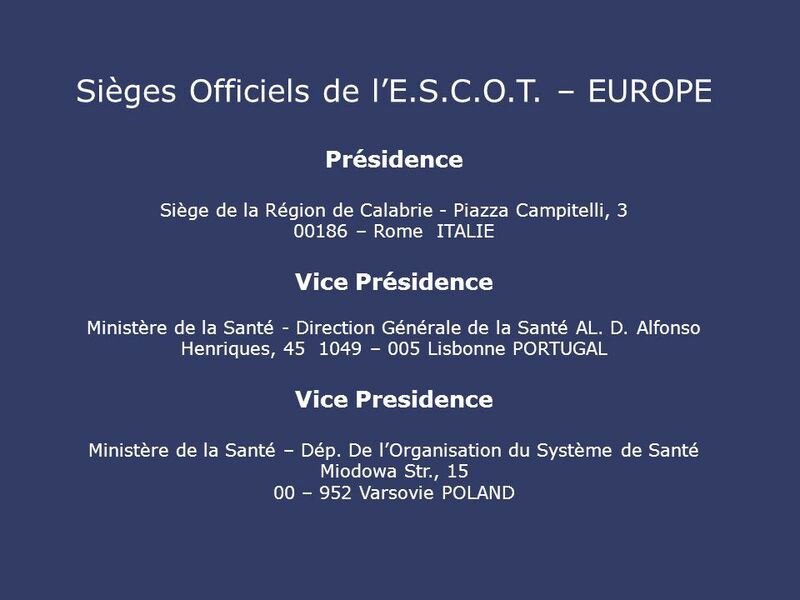 O bserving and promote services, products and the quality of the thermal supply of the State members of E.S.C.O.T. 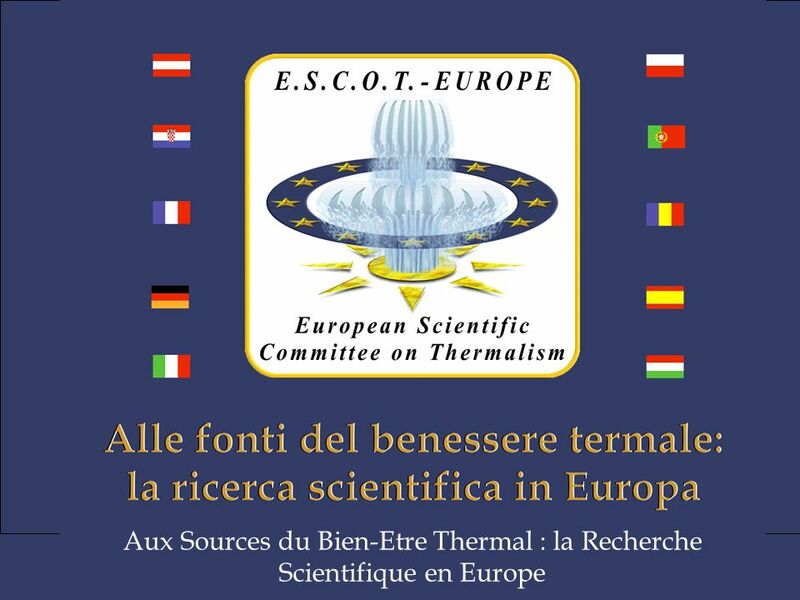 – EUROPE M ake aware and drive to a continuous update of techniques to doctors and to all the resources employed in the supply of thermalism, in particular by means of collaboration with scientific communities and associations concerned by thermalism. P romote and implement the research, the innovation and the development of new sectors services according to the needs of the European citizens. 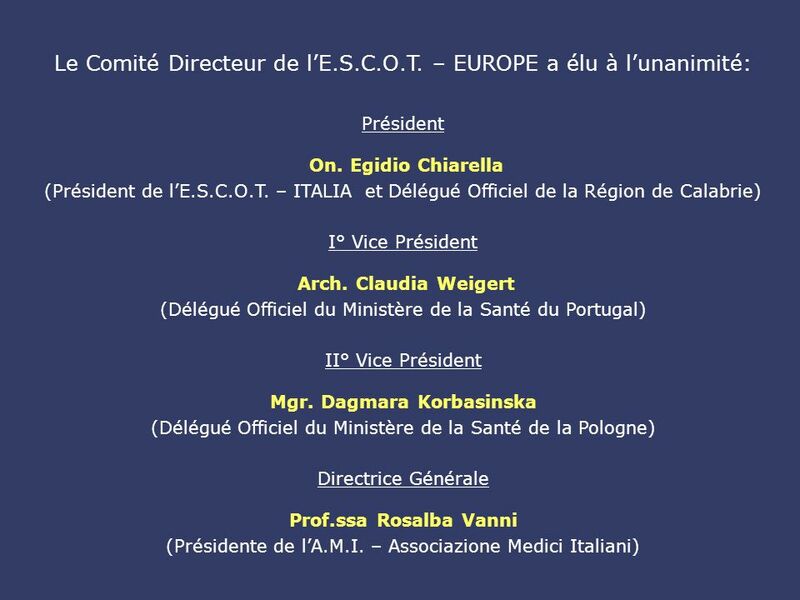 C ooperate with the highest European institutions and adopt any initiative which can drive to a quality improvement of services and European health resorts supplies. 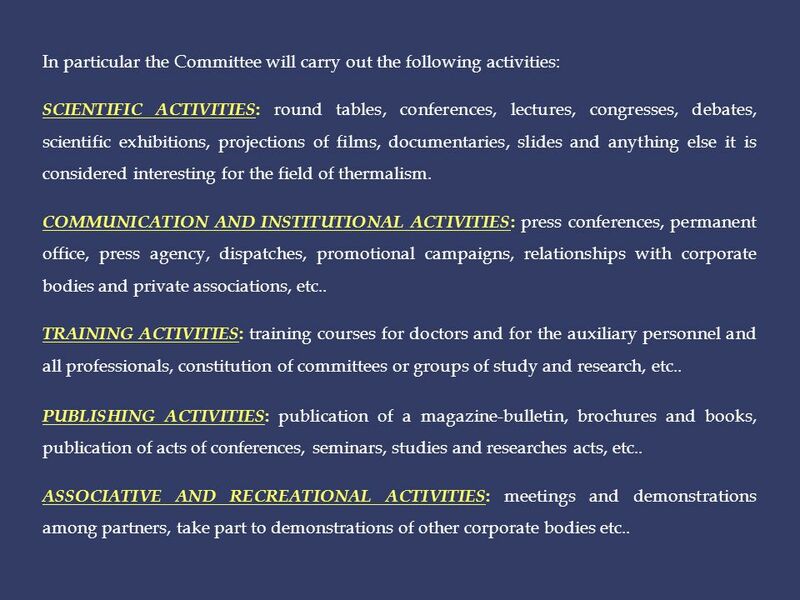 11 In particular the Committee will carry out the following activities: SCIENTIFIC ACTIVITIES : round tables, conferences, lectures, congresses, debates, scientific exhibitions, projections of films, documentaries, slides and anything else it is considered interesting for the field of thermalism. COMMUNICATION AND INSTITUTIONAL ACTIVITIES : press conferences, permanent office, press agency, dispatches, promotional campaigns, relationships with corporate bodies and private associations, etc.. TRAINING ACTIVITIES : training courses for doctors and for the auxiliary personnel and all professionals, constitution of committees or groups of study and research, etc.. PUBLISHING ACTIVITIES : publication of a magazine-bulletin, brochures and books, publication of acts of conferences, seminars, studies and researches acts, etc.. ASSOCIATIVE AND RECREATIONAL ACTIVITIES : meetings and demonstrations among partners, take part to demonstrations of other corporate bodies etc..
12 E.S.C.O.T. 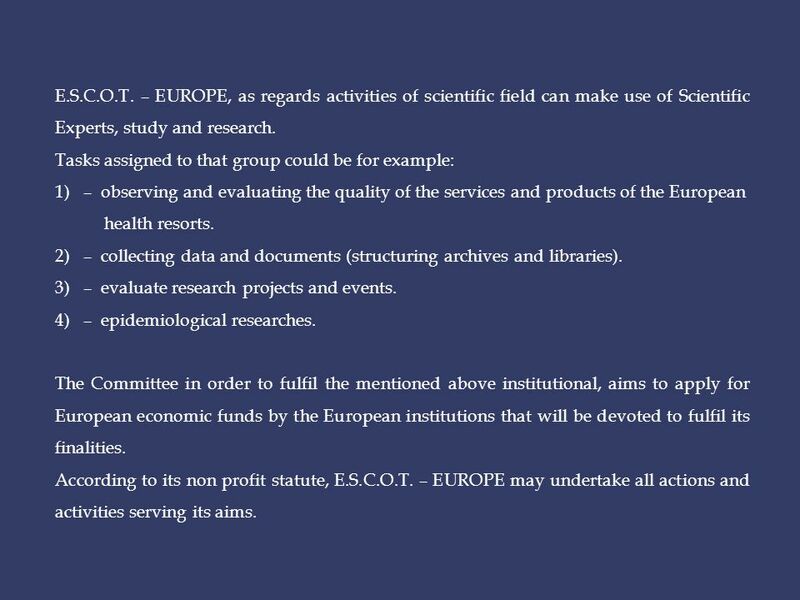 – EUROPE, as regards activities of scientific field can make use of Scientific Experts, study and research. Tasks assigned to that group could be for example: 1) – observing and evaluating the quality of the services and products of the European health resorts. 2) – collecting data and documents (structuring archives and libraries). 3) – evaluate research projects and events. 4) – epidemiological researches. The Committee in order to fulfil the mentioned above institutional, aims to apply for European economic funds by the European institutions that will be devoted to fulfil its finalities. According to its non profit statute, E.S.C.O.T. – EUROPE may undertake all actions and activities serving its aims. Télécharger ppt "Organisation de la recherche thermale en Europe 1° Symposium thermal européen France Aix – Les – Bains 15 – 16 – 17 novembre 2006 Autriche Croatie France."